It is well-known that the single biggest problem besetting our civil justice system is DELAY. Unlike various other areas which invite significant attention from the international donor community and the media (such as anti-terrorism, anti-discrimination and anti-corruption laws), the civil justice system has long been subjected to sustained neglect. This is ironic because the civil justice system is the area which the largest number of ordinary Pakistani interact with. The personnel at Law and Policy Chambers are interested in providing Technical Support to all projects which aim to reform Pakistan's civil justice system. 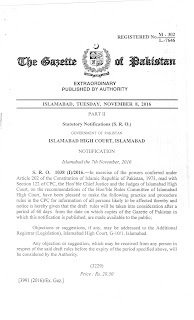 The Rule Committee of Islamabad High Court has proposed certain amendments to the practice and procedure rules made under Code of Civil Procedure, 1908 which aim at fight delays. The amendments aim to expedite the process of civil adjudication by introducing the concept of Case Scheduling. In the words of His Honor Judge Kamran Basharat Mufti, the chief architect of these reforms, the key to fighting delay lies in "shifting the control of litigation from the litigants to the courts, extending a proactive managerial role of the Presiding Officers." The reforms are inspired by a thorough study of the evolution of civil procedure in other common law jurisdictions, in particular, the Federal Rules of Civil Procedure of the United State and Woolf Reforms in the UK. If implemented in letter and spirit, these reforms promise to revolutionize the delivery of civil justice and substantially reduce delay. The High Court has invited comments on the subject from all and concerned citizens. The Law and Policy Chambers encourages you to participate in this process. An empirical study of case files is the first step toward understanding the extend and the causes of delay. This pilot study conducted by Umer Gilani back in 2011 represents a step in that direction.